In reviewing this book, I found the concepts quite sane. Dr. Rankin covers a number of medical studies. She differentiates between “true fear” and “false fear.” Essentially, a real fear is being chased down by a brown bear whereas a false fear is carrying on a belief system or fear in areas that don’t make any more sense but affect the same part of the brain. These are areas including fear of losing your job even though you just got a promotion. Believing that something bad is going to happen when there is no indication that it will. It is that constant worrying and fear that brings a lot of grief to your life. It is normal to grieve the loss of your parents, but to think everybody else important in your life is going to die tragically and leave you alone is taking it a step too far. Fear has its purpose when it is a true fear, it is part of our defence mechanism that we needed as lived long ago in primitive times. Today, we get fearful and we signal the brain to produce the same fear triggers that put us into action, however, it is not needed and causes us problems to constantly be in a state of fear. The author discusses the Small Self or ego which is concerned about your image and how things should be done according to societal expectations. Then there is the Inner Pilot Life which is basically the Higher Self and is run mainly by your intuition. This is a skill that you need to develop. We are inter-connected and so the oneness that we feel with the Universe puts us in a good position of listening to your intuition in all times, not only in fearful times. How many times have you had a hunch to do or say something but did not do so or fell silent? Did you not take that right hand turn driving home and proceeded straight only to find that there is a traffic delay due to an accident, whereas had you listened to your intuition, you would have by-passed the entire accident? Listening to your intuition can make your life easier and more fulfilling. If you challenge yourself with things that scare you, you can become more desensitized to it and act from a position of courage. It takes courage to deal with your false fears. By being able to “win” over your fears, you will feel stronger and more able to deal with other fears. You can start by beginning with baby goals that are not as fear inducing. With each step, you will find that you are able to do more and more. In essence, it is more important to choose soul alignment instead of security and comfort to continue to become more aligned with your Inner Pilot Light. You can always pray when fear is hitting you between the eyes. In reviewing this book, I particularly liked the Appendices as they seem to tidy up all the main concepts of the book and put them into actionable bits. As well, throughout the book, Dr. Rankin has placed Courage-Cultivating Exercises which make you think of how and why fear is dominating your life and what you can do to change it. 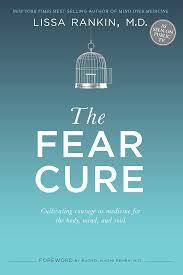 I think this book is good for anyone who has excessive amounts of fear in their lives which could be almost everybody. I think it is especially good for people dealing with depression, anxiety and panic disorders. It helps to create some sanity over the illogical excessive use of fear. In the end, Dr. Rankin pushes the envelope of what “medicine” can be and how it is to be interpreted. I reviewed every part of the book and found it quite interesting and so recommend it highly.